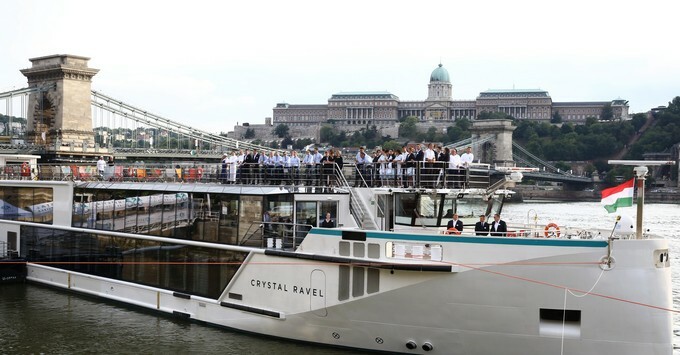 (11 a.m. EDT) -- In the shadow of Budapest's famed Chain Bridge on July 11, Crystal River Cruises christened its latest luxury river cruise ship, the 106-passenger Crystal Ravel. The ship is the fifth ship for the less-than-two-year old river arm of luxury line Crystal Cruises, and the fourth of its Rhine class vessels. Out of the gate, the line has won several top travel industry awards, including Best Dining in Cruise Critic's 2017 Editors Picks. 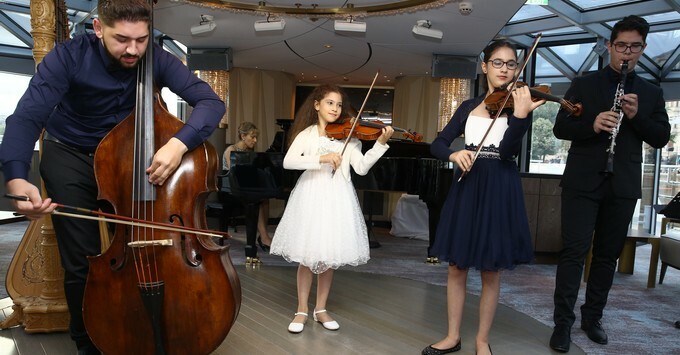 Crystal chose Mariann Peller, creator of the hit Hungarian classical music talent show for children, "Virtuosos," as the godmother of the ship. The selection continues a trend, as Broadway singer and actor Rachel York served as godmother for sister ship Crystal Debussy in May. Crystal River Cruises' Vice President and Managing Director Walter Littlejohn became choked up as he stood on the banks of the Danube River and spoke of the line's success. He hinted that the two godmothers, both in the entertainment industry, might signal an upcoming focus for the line. Littlejohn also hinted that the luxury line might move into family-friendly sailings at some point, citing a possible location for a kids' club and the fact that Crystal Mozart has all triple-occupancy cabins. Future improvements and offerings aside, Crystal Ravel is not a departure for the line. The vessel is identical to the ships that came before her, with a few small exceptions. For a line that has long racked up awards for a formal style of food and service, the river ship serves up a more relaxed version of luxury, where breakfast in the main dining room is not a buffet, but a station-style presentation with chefs serving passengers from trays. (One executive dubbed the style a "servery" for lack of a better word.) Even the formal outfits of the waiters have been replaced with more casual ones, and white tablecloths have been swapped out for modern, woven placemats. At night, there are no formal dress codes for guests. Since the launch of the first river ship in 2016, Crystal Mozart — a refurbished Peter Deilmann ship — there have been few changes. The original much-touted electric bikes have been removed because of storage issues and now the line works with local operators to offer them in several ports. The six-person yachts that the ships sailed with originally blocked the views from the aft pool, and so those are now kept in key ports and brought out when chartered by guests. In addition, a lobby bathroom was removed from the floorplan to make way for a small coffee and pastry station. Such small tweaks testify to the fast success of the line as well as the planning that went into its launch. Crystal River is unlike most river cruises, in that it doesn't have nightly presentations from the cruise director. It also has open seating dining rooms with plenty of two- and four-top tables, and an impressive level of food quality. (At lunch in Vintages, the beautiful and artful plating compares favorably to many Michelin-starred restaurants.) Passengers in suites are given one complimentary dinner at a Michelin-starred restaurant in port, and other guests onboard have the option of booking these dinners — which come with transportation — as a shore excursion. In addition, the line also has custom tour buses that come decked out with Wi-Fi, larger seats, and even coffee and beverage services, and the ships themselves have the first pop-up bars on the roof deck, which can be lowered to go under Europe's bridges. For more on Crystal River, see recent Cruise Critic reviews of Crystal Mahler and Crystal Bach.